Yesterday, the audio album of Nagarjuna’s upcoming light-hearted comedy drama, Oopiri’s Tamil version Thozha, was unveiled in a glittering ceremony in Chennai. Popular Tamil star Suriya graced the event as the chief guest. Speaking on the occasion, Nag drenched Suriya in countless praises. Nag said that he is a fan of a very few actors and that Suriya is one among them. Nag revealed that he started to admire Suriya’s work since the latter’s Ghajini. 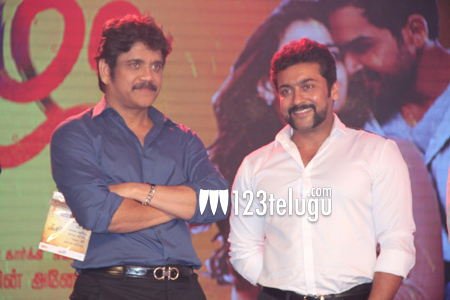 Nag also said that Suriya is a bigger star not just in Tamil Nadu but also in Telangana and Andhra Pradesh. Oopiri also stars Suriya’s brother Karthi and Tamannaah in pivotal roles. The film’s music was scored by Malayali composer Gopi Sundar. Produced by PVP Cinema, this Telugu-Tamil bilingual is gearing up for a wide release on March 25.